The township was originally surveyed in 1795 when twenty four lots were laid out on the first concession. It was named for Alnwick in Northumberland, England. The area was then known as the Home District, Province of Upper Canada. The first crown grants were issued in 1798 and other surveys followed in 1826 and 1835. In 1816 the area was known as the Newcastle District. The 1835 survey set aside 3600 acres of the first and second concession as an Indian settlement. The Indian band was moved in from Grape island shortly thereafter and a school and church were built at Alderville. It is incorrect to interpret that the original land grantees were settlers. Most never set foot in the area. The real settlers arrived in the 1830's. The first council meeting was held in 1845 at Alderville school. There was a post office at Alderville but none at "the corners" (later named Roseneath after a town in Scotland). Some time after 1858, probably 1859, the post office was moved to Roseneath. By 1870, five Methodist churches were spread around the township. Other than Thackeray's (1866), Merrill's (1857) and Alderville (1838? ), there was a church on Joseph Sherwins's farm (amalgamated with Thackeray's in 1884) and one on John Linton's farm (Ebenezer ?). The Sherwin church was moved to Manassah Brown's farm (lot 9-1) and was used as a house. Other churches in the township were the Church of England (1863) north of Roseneath and Presbyterian (1862) in Roseneath. The present United church in Roseneath was built in 1881-2. Cemeteries were located at Thackray's, Merrill's, Church of England and Alderville. Log schools were located at Alderville (1838), on lot 8 con 1 (1854), near Roseneath on lot 19 con 4 (abt 1840) and north-end on lot 20 con 6. By 1878, at least five sawmills, one steam driven, were located in the township. Four of these sawmills were located in the west part of the township. William Thackeray was born May 9, 1805 in Rufforth, Yorkshire. He came to Hamilton township sometime in 1833 ? On February 19, 1834 he married Margaret Brown in Cobourg, Ont. This marriage has an interesting story. Margaret Brown, was the daughter of William Brown and Hannah Turner who also arrived in Hamilton township in 1833. Margaret Brown was literally the "girl next door" as the Browns ended up living at lot nine, concession one, Alnwick the next farm to William at lot eight. However, my research has shown that prior to being married, they grew up together in Rufforth, Yorkshire. Bondsmen at their wedding were Thomas Sailsbury, innkeeper and Anthony Sherwin, yeoman. It is no coincidence, therefore, that the Browns, Thackerays and Sherwins ended up neighbours in Alnwick. William brown was born in Rufforth about 1790, the son of Anthony Brown and Mary Hardcastle. Mary Hardcastle appears to be the great aunt of William Hardcastle and his son William who later settled in Hamilton township. Margarets' mother, Hannah (Ann) Turner was born about 1790 in Acomb, Yorkshire, a neighbouring parish. Anthony Sherwin was christened Sept. 25, 1808 in Long Marsten, another neighbouring parish and home of the Hardcastles. 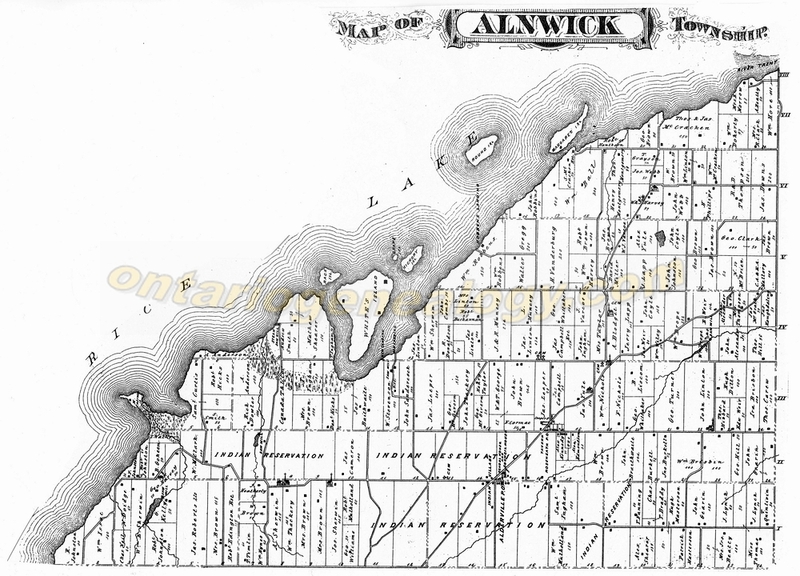 William Thackeray purchased lot 8, concession 1, Alnwick from a Mr. Flint who in turn purchased it from Alexander Grant in 1819 (it is believed that Alexander Grant had been the President of Upper Canada being appointed Sept.11, 1805). The deed was not registered until 1845 when he sold the west half (115 acres) to his friend Anthony Sherwin. It is known that the Browns lived in various places in Alnwick before moving to lot nine, concession one. William and Margarets' first son John was born in Alnwick Jan. 13, 1835. He is acknowledged as the first white male and probably the first white child born in the township and is certainly the first Thackeray born in Canada. Five other children, three daughters and two sons were also born. All lived to adulthood except Brown, a son, who drowned at the age of four. John married Annie Precious, Peter married Elizabeth White, Thressa married Edward Ellenor, Louisa married James Eddington and Charlotte married John Musgrove. Over the years, William Thackeray and his descendents played many roles in township affairs. William was a pathmaster, fence viewer and school trustee, his son John was reeve, served as clerk and was the local magistrate, his son Peter was reeve, his great grandson Barton was reeve, his great grandson Roley was tax collector and fence viewer, and his great grandson Clarence served on council. An early log school (1854) was built on the west half of lot eight. The school was used for church services and other meetings. After the new school was built in 1873, the log building was used as a Knights Templar lodge. William Thackeray donated land for a Wesleyan Methodist church (built 1866 but graves pre-date this) and cemetery. This church was known as Thackeray's church and is now known as Centenary. William Thackeray's home farm was held in the Thackeray name until 1998. At the present, two Thackeray families, Murray and his son John, still reside in the township.